“In those days came John the Baptist, preaching in the wilderness of Judaea. And saying, Repent ye: for the kingdom of heaven is at hand.” “Then went out to him Jerusalem, and all Judaea, and all the region round about Jordan, And were baptized of him in Jordan, confessing their sins.” Matthew 3:1,2,5,6. Here was a man at the River Jordan who was preaching and telling the people that the Messiah was soon to come and that they were to prepare for this event by confessing their sins, going down into the river, and being immersed under the water as a symbol of washing away their sins. 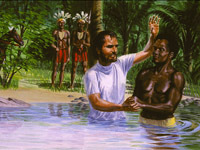 Baptism is one of the special monuments of the Christian church. The rite was included in the gospel commission. “Go ye therefore, and teach all nations, baptizing them in the name of the Father, and of the Son, and of the Holy Ghost: Teaching them to observe all things whatsoever I have commanded you: and, lo, I am with you alway, even unto the end of the world.” Matthew 28:19,20. This rite was not merely recommended to Christians, for Jesus Christ gave us His example. “Then cometh Jesus from Galilee to Jordan unto John, to be baptized of him.” Matthew 3:13. Jesus made it clear that baptism was prerequisite to entrance into His kingdom. “Jesus answered, Verily, verily, I say unto thee, Except a man be born of water and of the Spirit, he cannot enter into the kingdom of God.” John 3:5. The word “baptize” means “to immerse or dip under,” from the Greek baptizein. If John the Baptist had only sprinkled those who listened to his preaching, he would not have gone to the River Jordan. Any place would have done. The Bible indicates no method of baptism except by immersion. Does it really make any difference how baptism is performed? To answer this question we must grasp the meaning of baptism – what it stands for. “Know ye not, that so many of us as were baptized into Jesus Christ were baptized into His death? Therefore we are buried with Him by baptism into death: That like as Christ was raised up from the dead by the glory of the Father, even so we also should walk in newness of life. For if we have been planted together in the likeness of His death, we shall be also in the likeness of His resurrection:: Knowing this, that our old man is crucified with Him, that the body of sin might be destroyed, that henceforth we should not serve sin.” Romans 6:3-6. Baptism symbolizes the death of the old man and a rebirth to a new life in Christ. The old man is buried beneath the water. This is why in baptism the person goes completely under the water and then rises again. It also symbolizes a washing away of sins (Acts 22:16) as well as a pledge of the coming. There are several prerequisites necessary before an individual is ready for baptism. An infant cannot take any of these steps, therefore infant baptism is unbiblical. However it is Biblical to dedicate our children to the Lord. See Matthew 19:13-15. Baptism is the doorway to God’s church. “For by one spirit are we all baptized into one body, whether we be Jews or Gentiles, whether we be bond or free; and have been all made to drink into one Spirit.” I Corinthians 12:13. Christ is the head of this body, His church. Ephesians 4:15,16. Baptism is to be performed in the name of “the Father, the Son, and the Holy Ghost.” See Matthew 28:19. Normally baptism is performed only once in a person’s life, but there are occasions when it is proper to be rebaptized. For an example of this see Acts 19:1-5. These people had repented of their sins and been baptized, yet they did not have the full light of truth. When this was brought to them, they were rebaptized in the name of the Lord. The disciples were often arguing among themselves as to who would be the greatest in Christ”s kingdom. At this observance no one would humble himself enough to wash the dusty feet of the others, so it was Jesus, their Master, who showed them true humility, and He asks us to follow His example. This ordinance is to prepare one”s heart to receive the full blessing of communion. “There is in man a disposition to esteem himself more highly than his brother, to work for self, to seek the highest place; and often this results in evil surmising and bitterness of spirit. The ordinance preceding the Lord’s supper is to clear away these misunderstandings, to ring man out of his selfishness, down from his stilts of self-exaltation, to the humility of heart that will lead him to serve his brother.” – Ellen G. White, The Desire of Ages, p. 650. Only as we esteem others better than ourselves are our hearts truly in tune with God; our spirit becomes the same as His Spirit. Then we are ready to take part in the second and most solemn part of communion, partaking of the symbols of the body and blood of our Lord. Instruction as to how the communion is to be celebrated is found in 1 Corinthians 11:23-30. Please read these verses carefully. Communion should never be participated in lightly with little thought as to its significance, but the individual’s heart must be prepared for it, not in judging others but in sincere self-examination. “But let a man examine himself, and so let him eat of that bread, and drink of that cup.” 1 Corinthians 11:28. Lack of preparation will bring a curse upon a man. See 1 Corinthians 11:29. The symbolism of communion, also called the Lord’s Supper, has deep meaning for the participants. 1. The unleavened bread symbolizes the body of Christ. 1 Corinthians 11:24. 2. The unfermented wine symbolizes the blood of Christ. 1 Corinthians 11:25. 3. Communion both commemorates the Lord’s death and looks forward to His return. 1 Corinthians 11:26. This ordinance replaced the Jewish Passover, at which nothing fermented was permitted; hence unleavened bread and unfermented wine (pure grape juice) are used to symbolize the body and blood of Christ. In addition, note that this ordinance is to be celebrated within the church of God. Jesus did not celebrate it with the multitudes but exclusively with His disciples. “The ordinances of baptism and the Lord’s Supper are two monumental pillars, one without and one within the church. Upon these ordinances Christ has inscribed the name of the true God.” – Testimonies for the Church, vol. 6, p. 91. Just beneath the cross of Jesus, Looking up into His face. Save me then in Jesus name. 1. What was the theme of John the Baptist’s preaching? 2. What is one of the special monuments of the Christian church? 3. How important is baptism? 4. What is the proper mode of baptism? 5. What does baptism signify? 6. Give two Biblical examples of baptism by immersion. 7. Give four prerequisites for baptism. 8. Is infant baptism Biblical? 9. What is the doorway to God’s church? 10. What is a second monumental pillar of the Christian church? 11. What ordinance precedes the Lord’s Supper? Why? 12. 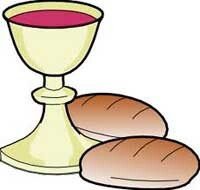 Why is unleavened bread and unfermented wine (grape juice) used for communion? 13. 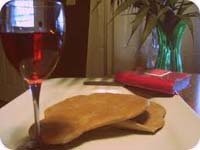 What do the bread and wine symbolize? 14. Does the Lord’s Supper point forward to some event, or does it look back, or both? 15. Is the Lord’s Supper service an ordinance within or without the church? 16. Thought question: Have I accepted the significance of these two monumental pillars?